"The dogs that we're considering are really the best of the best." 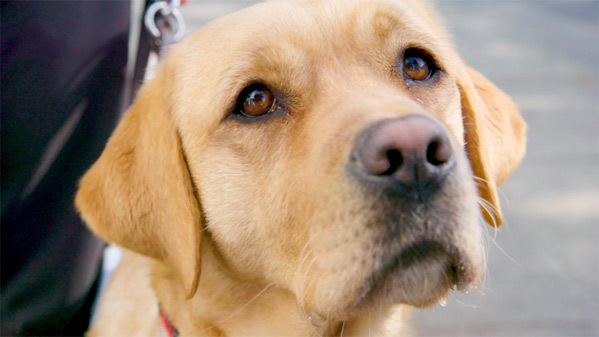 IFC Films has debuted a new official US trailer for the documentary Pick of the Litter, a film that follows puppies as they grow up and are trained to become Guide Dogs. This premiered at the Slamdance Film Festival earlier this year, which is when we posted the original trailer in January. "Cameras follow these pups through an intense two-year odyssey as they train to become dogs whose ultimate responsibility is to protect their blind partners from harm. Along the way, these remarkable animals rely on a community of dedicated individuals who train them to do amazing, life-changing things in the service of their human." Oh my goodness, as a dog lover I can't wait to see this. It looks like more than just a cute doc, about how hard it is to find the right dog for this tough job. You can still watch original festival trailer for Pick of the Litter here, for a bit more footage from this doc. Pick of the Litter follows a litter of puppies from the moment they're born and begin their quest to become Guide Dogs for the Blind, the ultimate canine career. Cameras follow these pups through a two-year odyssey as they train to become dogs whose ultimate responsibility is to protect their blind partners from harm. Along the way, the dogs meet a community of dedicated individuals who train them to do amazing, life-changing things in the service of their human. The stakes are high and not every dog can make the cut. Only the best of the best. The pick of the litter. Pick of the Litter is co-directed by filmmakers Don Hardy Jr. (Witch Hunt, Love Hate Love, The Human Experiment, Theory of Obscurity) and Dana Nachman (Witch Hunt, Love Hate Love, The Human Experiment, Batkid Begins). The first premiered at the 2018 Slamdance Film Festival this year. IFC will release Pick of the Litter in select theaters starting August 31st.